Last week, we celebrated Holocaust Remembrance Day in Israel. On a collective level, we are mourning for more than 6 million Jews murdered by the Nazis. On an individual level, we each remember members of our own families as well. I don’t know all their names…that is the saddest part of all, I think. Their memories live on but in a blur because we know my grandfather had two sisters that remained behind in Poland, but we aren’t quite sure what they were called. I can’t really tell you why that is so important – other than that it is. Without names, they are part of the six million…but still lost. A name is the most basic thing of all. It doesn’t define you but it is uniquely yours. Even if in some later or earlier generation there was another, still it is yours and yours alone for the time you have it. Without a name, there might have been an earlier generation, but there never will be a later one…the name is lost. Of all the relatives, there are two that haunt me most. My husband lost all four of his grandparents to the Nazis – but we have their names. Today there are seven Shayes, several Esthers. Yehoshua lives on in my husband’s cousin; Shmuel lives on in our son. The first name that haunts me belonged to my mother-in-law’s oldest brother. She asked that we give our first son his name, and we did. We know that her brother was the first of the family taken by the Nazis…just before the Passover seder in 1944. It seems so tragic to be a newlywed…to take a wife…and then in that wonderful and exciting first month, to be taken, terrorized, separated, and murdered. My son’s daughter, my precious granddaughter carries the second name that has haunted me for 30 years. When I was pregnant with our first child, our beloved oldest daughter and mother to our first grandchild, we began thinking about names…if it is a boy…if it is a girl. In my heart, with no ultrasound and no logic, I knew I was carrying a girl. Boys’ names passed me by with no interest until finally we rationalized that we would have 8 days to come up with a boy’s name but needed a girl’s name “just in case.” I didn’t care. I knew it would be a girl…and she was born on Rosh Hashana. In the end, she is named for my grandmother with a bit of her second name honoring my husband’s aunt…another victim of the Holocaust. The name my mother-in-law didn’t want me to use was Gavriella, her young sister who died in 1944, because tradition told her that you do not name a child for another who died young. There are many who say you can get around this by giving a secondary name of someone who lived a long and blessed life; others say that when someone dies in “Kiddush HaShem” – in the sanctification of God’s name, there is no issue. 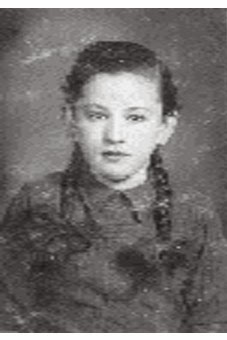 My mother-in-law was afraid and so the name of her murdered 12 year old sister was not given to her first granddaughter, the only one she lived long enough to touch, to hold, to love. Her second granddaughter was born five years after she died and carries her name but my mother-in-law never lived long enough to see Gavriella remembered. I didn’t argue with my mother-in-law. I accepted that she was resigned to our not using the name. The next two grandchildren born to her were both boys and the issue never came up again. But the name haunted me…who would stand for Gabriella? Would we forever leave her name behind in the cold ashes of Auschwitz while my children and others would be born into the sunshine of Israel. I longed for her; I mourned for her. When my youngest daughter turned 12 and celebrated her bat mitzvah, I thought of Gavriella and mourned anew. As I watched my young daughter grow with her friends, tall and beautiful, free and happy in Israel, it seemed to me that Gavriella’s world got darker and farther away. And then, my son and daughter-in-law asked us for names for their unborn child…we didn’t have many to give…but almost at the top of my list, the first I thought of…was Gavriella. A few nights ago, I took a video of little Michal Gavriella dancing to music. Each time the music stopped, my brilliant toddler granddaughter bent down, pressed a button and started dancing again. And somewhere in the heavens, I dream that Gavriella is dancing too….